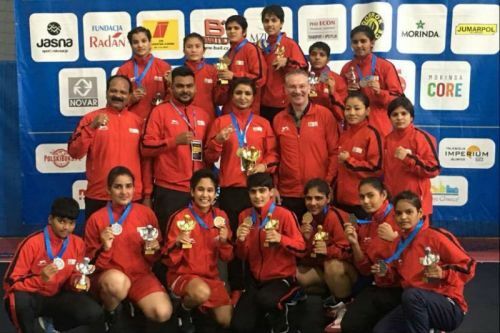 The junior boxers set the Gliwice rings on fire, as they made a sweep of medals in all 13 categories, which included six gold, six silver and a bronze to create history in the 13th International Silesian Boxing Championships for women in Poland late on Friday night. While the tournament witnessed a rich pool of pugilists from all the 17 participating nations, the Indian boxers pulled off a special feat with as many as 12 entering the finals. It was a rich medal haul with all the boxers earning a podium finish. Bharti, Tingmila Doungel, Sandeep Kaur, Neha, Arshi and Komal secured the yellow metal, while Amisha, Sanya Negi, Aashreya, Mitika, Raj Sahiba and Lipakshi settled for silver. The lone bronze came the way of Neha who had entered the semi-finals. In the finals, Bharti won her 46 kg class bout with a unanimous 5:0 verdict over Poland’s Izabela Iwanczuk to set the ball in motion. This was followed by Tingmila Doungel, a student from boxing legend Mary Kom’s academy; she downed Eleina of Germany, also with a 5:0 scoreline in 48 kg category. Next in line, Sandeep Kaur also enjoyed a similar scoreline against Poland’s Karolina Ampulska in 52 kg. The most enthralling bout turned out to be the one between Komal and Zybura of Poland, billed as the blue-ribband final with the Polish woman as the favourite. But the Indian came out with flying colours in the first round itself, sending down a series of combination punches on her rival, forcing the referee to stop the contest in round one itself. Neha in 54 kg too added to the list of gold with a split decision of 3:2 against her Latvian opponent, Nikolina. Among the silver medal winners, Sanya Negi in 60 kg class lost by split decision (2-3) to her Swedish rival Thelma as did Mitika and Amisha against the host pugilists Natalia and Alexes respectively by clear 0:5 margins. Lastly, it was easy for Arshi in 57 kg as she did not have to enter the rings as her opponent Leona from Sweden,gave a walkover. Coach, Amanpreet Chaudhury was adjudged the best coach of the tournament.